(Thor I#300 (fb))- Around 1000 years ago, the alien Celestials forced the gods of Earth to sever relations with mortals and stop trafficking on Earth. (Thor Annual#10)- Odin petitioned the Godheads to each send a delegate to oppose Demogorge. Definitely - Odin, and (from left to right) Zeus (Olympian), Vishnu (Hindu), Buluku (African), Osiris (Egyptian), Tezcatlipoca (Mexican), and Izanagi (Japanese). The small bit of face in the corner could be Manitou (Native American) since he sent Tawa, and we're not sure about the guy in the helmet below Tezcalipoca. 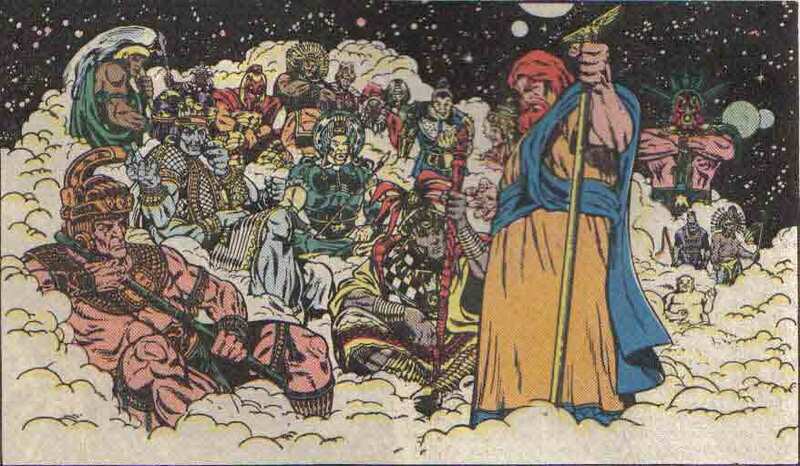 (Infinity Gauntlet#2)- The Godheads met in Asgard to discuss the disappearance of half of the beings in the universe. Those present were Itzamna (Mayan), Manitou (Native American), Nuada/Nuadhu (Celtic), Odin (see comments) (Asgardian), Osiris (Egyptian), Svarog (Russian), Tezcatlipoca (Mexican), and Zeus (Olympian). (Marvel Universe: The End#2) - A group of Godheads met to discuss the actions of Akhenaten against humanity: Atar (Vedic/Persian), Horus (Egyptian), Hunab Ku (Mayan), Izanagi (Japanese), Ndriananahary (African, Buluku), Shou-Hsing (Chinese), Thor (Asgardian), Vishnu (Hindu), Zeus (Olympian). They also discussed summoning Those of the Forgotten Realm. Horus, who was most familiar with Akhenaten used the Eye of Ra to spy on the powerful being, but Akhenaten detected them and attacked, destroying all present, except Thor and Zeus, who managed to flee. (Marvel Universe: The End#4 (BTS))- Thanos gained the virtually unlimited power of the Heart of the Infinite and altered time so that Akhenaten never gained his power, effectively undoing his actions and restoring those he had destroyed. However, to those who could understand or even remember what had happened, these actions were seen as the replacement of one threat with another, perhaps even worse. (Marvel Universe: The End#5-6)- The Godheads joined together with a multitude of heroes and villains from Earth and the rest of the universe to oppose Thanos, who had gained supreme power from the Heart of the Infinite. 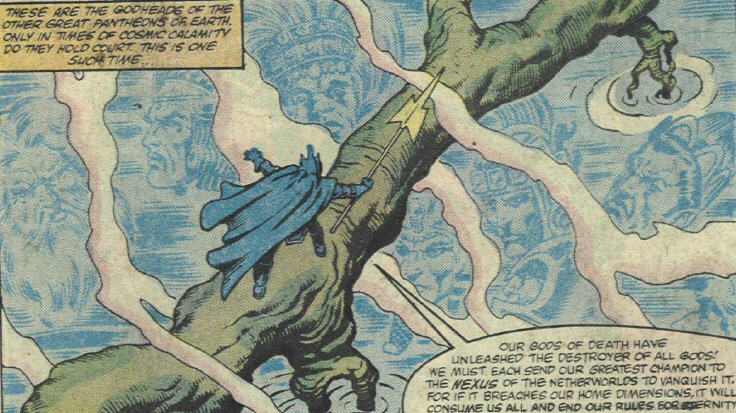 Thanos easily wiped out every single being in the universe, but later was convinced by Adam Warlock to sacrifice himself to restore the universe to its previous state. (Thor II#61)- Thor was called before the Council Elite to be tested for worthiness to join them, as a replacement for Odin. Thor passed the tests of awareness and insight, but failed when he supplied food to a starving population, rather than teaching them to grow their own food. 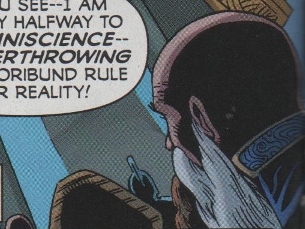 In addition, the Council decided that Thor had violated the oath of non-interference on Earth. Those present were Osiris (Egyptian), Yu-Hang (Chinese), Zeus (Olympian), and the Hindu Trinity (Brahma, Shiva, and Vishnu). (Thor II#65)- The Council Elite met once again (the same group) and discussed Thor's continued problems, including his most recent effort to resurrect a young girl. They discussed whether steps needed to be taken against Thor, but decided that mankind current plans were sufficient for the moment. (Incredible Hercules#116-117) - The Council of Godheads gathered by Athena to prepare a force with which to combat the Skrullian gods. Gods attending: Altjira (Aboriginal), Anansi (Vodu), Ammon Ra (Ennead; later also present as Demogorge), Anu (Annunaki), Buddha, Hodiak (Inua), Horus (Ennead), Hunab Ku (Ahau), Inti (Inca), Itzamna (Ahau), Izanagi (Amatsu-Kami; present in two forms), Manitou (Manidoog), Ndriananahary (Vodu), Osiris (Egyptian), Shou-Hsing (Chinese), Tame (Akua), Tezcatlipoca, Ukko (Jumala), Ulgen (Tenger), Viracocha (Apu), Vishnu (Devas), and Yu Huang (Chinese). Also present were Okonorote & Tomazooma. (Secret Warriors#10 (fb)) - The Council met to formally usher in Alexander Aaron as the new Phobos, Olympian god of fear. Balder, Hera, & Quetzacoatl presided over the ceremony, though there were lots of other gods present, including godheads such as Brahma, Demogorge, and Inti, and possibly Atar, Buddha, Gaea, Itzamna, and Osiris. And some Eternals, including their leader, Zuras. (Heroic Age: Prince of Power#1) - The Council met to discuss who would be the greatest hero of the heroic age. Captain America, Iron Man, and Thor were proposed by some, and Athena told them with certainty that it was Amadeus Cho. The other figures are shadowed, but can be identified as Anansi, Balder, Hodiak, Horus, Inti, and Izanagi on the one page. 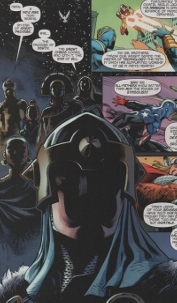 Balder and Anansi are clearly seen in a lower panel, and then pretty clearly Shou Hsing, Ukko (or whoever has that helmet), and someone in a triangular headdress (presumably Osiris) in. (Chaos War#1) - The Council of Godheads summoned Hercules and Amadeus Cho before them to judge them on Hercules' recent empowerment and actions in preparation for the arrival of the Chaos King (Amatsu-Mikaboshi). Overwhelmed by his new power and outraged that the Godheads didn't use their power to do anything, Hercules attacked them, battering them about until Thor arrived and convinced Hercules to get himself under control. Those seen include Ammon Ra, Balder, Buddha, Inti, Ndriananahary, Osiris, Ukko, Tezcatlipoca, Yu Huang, and many others, harder to identify. (Chaos War#3) - Chaos King duped Hercules into identifying the location of the Council's throneroom, allowing the Chaos King to lead his hordes there to attack. The Godheads swiftly fell before the assault. (Chaos War#4) - BTS. Those destroyed by the Chaos King were revived. (Journey into Mystery#627) - The Council gathered at the Infinite Embassy to discuss the threat of Odin's brother the Serpent (Cul), Asagardian god of fear, and Odin's plan to destroy Earth to eliminate the Serpent. Those seen included Brahma, Manitou, Inti, Itzamna, Odin, Vishnu, Yu Huang, and Zeus. COMMENTS: Created by Mark Gruenwald, Ralph Macchio, and Keith Pollard. Zeus (Olympian) is the big guy at center stage. Odin (Asgardian)is in the chariot. the big guy in the foreground with the staff is obviously Tezcatlipoca (Aztec/Mexican). The blue-skinned four-armed guy is obviously Vishnu (Hindu). Oriental guy in green is probably the Chinese Yu Huang in attire other than his Thor I#301 appearance. To Zeus's right with the staff is the Mayan/Mexican Itzamna. 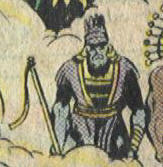 The Native American figure in the feathered headdress may be Manitou in a garb other than his Infinity Gauntlet#2 appearance. Over his left and in the feathered headdress is Viracocha. Tomazooma-This is confirmed in the Fantastic Four Index#80--Snood. The spiky head-dress resembles the crowns I've seen in Phoenician hieroglyphics. Osiris around this time may still have been imprisoned by Seth. Bottom right, to Odin's right. Believe it or not, I am by a reliable source at Marvel that this is Buddha. 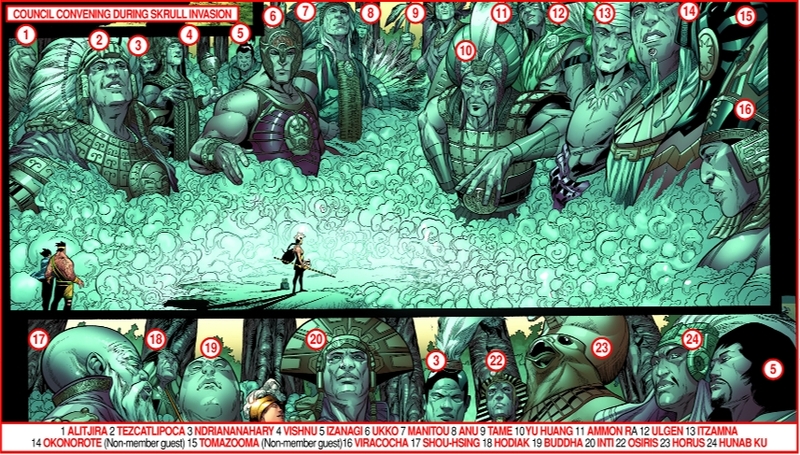 Of the nineteen Sky-Fathers seen in Thor#300, ten are more or less easily identifiable: Odin, Zeus, Yu-Huang, Vishnu, Tomazooma, Tezcatlipoca, an Inca god who was presumably Viracocha, and a Yoruba god who was presumably Olodumare (these last two names selected from Michael Jordan's The Encyclopedia of Gods; we know that the Inca gods and the Yoruba gods were involved, but we don't know if these are the leaders of those pantheons in the Marvel Universe). Of the remaining nine, one is presumably Osiris, for some reason not in his customary attire, or perhaps his proxy. Six others are known to be from the Inuit, Celtic, Persian, Babylonian, Pueblo, and Aboriginal pantheons (based on Thor#301 (where Thor collected energy from various named pantheons) and Thor Annual#10 (where he teamed up with gods from various named pantheons)). 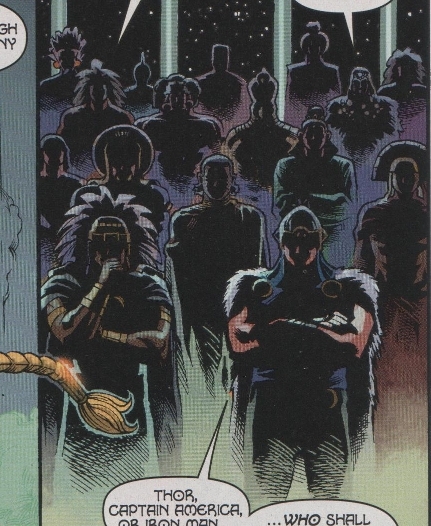 While there are several Inuit pantheons, Infinity Gauntlet#2 showed that the better-known Sky-Fathers are acquainted with the Ojibwa god Manitou, suggesting that his pantheon represented the Inuit (I think I read that the Ojibwa are considered Inuits. ); Infinity Gauntlet#2 also identified Nuada as the head of the Celtic gods. Educated guesses indicate that the Sky-Fathers of the Persian, Babylonian, Pueblo, and Aboriginal pantheons are, respectively, Mithra, Anu, Awonawilona, and Thuremlin (although this last is particularly debatable). 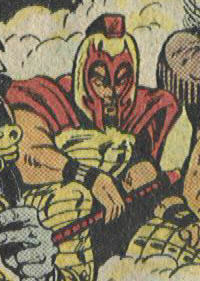 This leaves two pantheons unidentified, but it can be presumed that these were the Russian gods and the Polynesian gods; Svarog of the Russian gods was present in Infinity Gauntlet#2, while the Polynesian gods were, if nothing else, the only pantheon specifically listed in the Official Handbook of the Marvel Universe which has not been demonstrated to have opposed the Third Celestial Host, allowing Tangaroa (another guess) to win the role by default. Osiris could not have been one of the gods in Thor I#300-fb, since that flashback took place around 1000, and Osiris was imprisoned by Seth during the time of Cleopatra. The "Yoruba god" has since been confirmed/ret-conned as Buluku. I think we can ASSume that some members were either not present or just not seen, while other pantheons and their subdivisions sent more than one representative. I think the Godheads by Pantheon list is fairly complete.--Snood. (What If? I#32) - A number of godheads and demonlords are seen as Korvac erected a mystic barrier preventing any other dimensions from accessing Earth. (What If? II#38) - In the alternate reality of where Seth conquered the Asgardians (diverging from Thor I#400), Earth-Thor-Thrall of Set, a council of Godheads met to make plans to resuce Asgard should it prove unable to overcome this defeat. This union included Buluku (African), Izanagi (Japanese), Osiris (Egyptian), Quetzacoatl (Mexican), Vishnu (Hindu), Yu-Huang (Chinese), and Zeus (Olympian)...and Mephisto was present as well, speaking for the Death Gods. 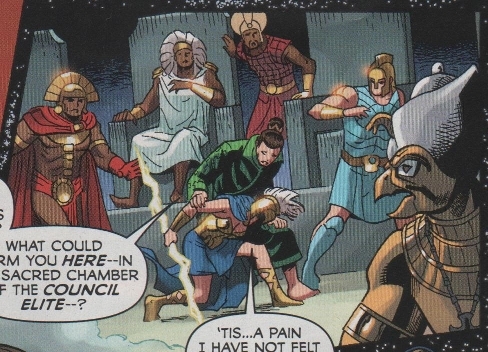 According to Per Degaton, The inestimable Don Campbell points out that it was actually Loki possessing Odin's body who took attended that meeting of the council of godheads in Infinity Gauntlet#2, as he impersonated Odin for nearly all of Eric Masterson's tenure as Thor. This profile is messy, messy, messy. I don't know how else to organize it, though. sorry. Don Campbell adds: From the time that "Odin" awoke from his Odin-sleep and ordered Heimdall to punish Thor (Thor I#432) until Odin was released from Mephisto's soul-shroud and reclaimed his body (Thor I#455), every appearance by "Odin" was actually Loki in Odin's body. I can only assume that the Infinity Gauntlet#2 appearance MUST also be an example of Loki pretending to be Odin, presumably with the secret help of his ally, the Norn Queen Karnilla. In addition to the observed pantheons, in Marvel Universe: The End#2, Those of the Forgotten Zone were referenced. That would presumably cover all pantheons no longer remotely active on Earth. If anyone can contact Ralph Macchio or Keith Pollard and help us confirm the characters from the top image, it would be much appreciated. Alternatively, if you feel you can identify them definitively yourself, feel free. The Innua (Inuit/Eskimo) may or may not be a separate pantheon. 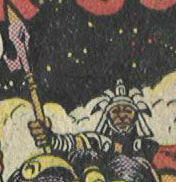 The Pueblo are referenced in Thor Annual#10, and might refer to Awonawilona. Australian/Aboriginal Gods - mentioned in the OHotMU, but not seen. Thuremlin per Ronald Byrd, Baiame per Eric J. Moreels and OHotMU 2006#3. --In Egyptian myth, Osiris was never more than god of the dead. --Ammon Ra, however, was considered the Egyptian counterpart to Zeus (or Ouranos?). but all the myths revere Amaterasu as the true power and her husband as sort of a "figurehead"
--My book on African spirits places a lot of importance as Nyambe as ruler, judge and Great Spirit. --Lusa (Voodoo) is mentioned only as the sun-god who fathered the Great Twins of which Shango and Damballah are two of. 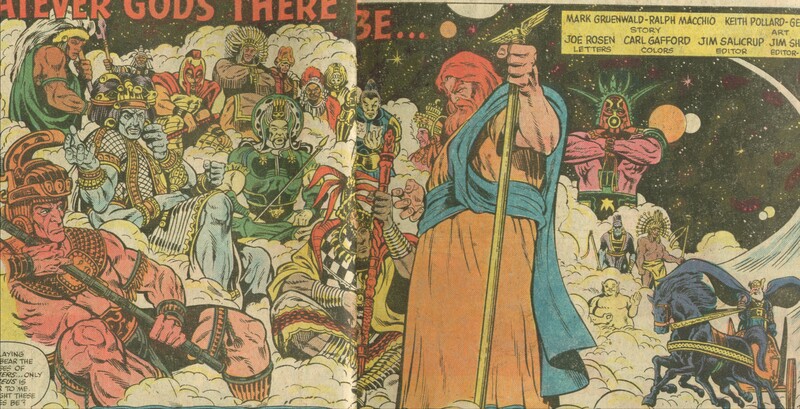 --According to a former intern from Marvel, in What If I#32, the character seen in the bottom right panel of the gods and demons blocked from accessing Earth by Korvac was supposed to be Yahweh, though it looks more like Jesus. He has a full entry as Atum.